It started with a White Coat Ceremony in May and ended with a Pinning Ceremony in June, and the six weeks in between offered life-altering experiences and unprecedented access to educational resources at the University of Florida for 80 underrepresented and minority undergraduate college students from California to Vermont, Minnesota to Texas and New York to Puerto Rico. While everyone is created equal, a variety of factors can prevent equal access and exposure to academic resources for young adults from communities and families of social, economic and educational disadvantage — including those interested in health professions education. Enter the University of Florida Summer Health Professions Education Program, or UF SHPEP, which made its debut this summer. Funded by a $415,000 grant from the Robert Wood Johnson Foundation, or RWJF, plus in-kind donations from the six health colleges, the free residential program focused on improving access to health professions, information, and resources for freshmen and sophomores from 54 colleges and universities across the country, including eight students from UF. The unique opportunity was not lost on the appreciative students. Formerly known as the Summer Medical and Dental Education Program, SHPEP expanded in 2016 to include a broader array of health professions and now has 13 program sites nationwide as part of the RWJF’s mission to build a national culture of health. Four main career pathways formed the interdisciplinary, interprofessional curriculum at UF’s SHPEP site: dentistry, medicine, pharmacy, and public health and health professions. There also were closer-look segments in nursing, physician assistant studies and veterinary medicine. The big-picture emphasis was interprofessional education and an understanding of how each profession fits into the health care field globally, said Amy Blue, Ph.D., associate dean for educational affairs at the UF College of Public Health and Health Professions, and associate vice president for interprofessional education at UF Health. Patty Probert, Ph.D., assistant dean for the Office of Student Advocacy & Inclusion in the UF College of Dentistry, was the principal investigator on the RWJF grant. She led a diverse group of around 20 faculty and staff members representing all six UF Health colleges that formed in October 2016 after UF received the RWJF grant. Like the SHPEP students, the team gelled throughout the program. The team developed the admissions process, the curriculum components, programming, operational details and much more. With a total operating budget of $905,000, the UF SHPEP program covered travel, transportation, food and on-campus room and board for all participants, who were selected by the faculty and staff admissions subcommittee through an application process in spring 2017. The 80 students, known as scholars, got intense exposure to academic health, but SHPEP offered much more. They learned about health care opportunities in the Air Force, Army and Navy; they attended a college stress and coping workshop; and they learned about community outreach with HealthStreet, a College of Medicine, College of Public Health and Health Professions and UF Clinical and Translational Science Institute community-engagement program. SHPEP even provided modules in career and study skill development, leadership and communication skills, health policy education, financial literacy and civil rights. Mock admissions interviews and essays, hands-on clinical experiences, and didactic and clinical interaction with faculty from the six health colleges empowered students to believe they can accomplish goals they didn’t know were possible. The curriculum included participation in dentistry’s Impressions Program, a chance to shadow physicians in an operating room, a toxicology and poison control workshop, and listening to heartbeats on simulation mannequins in the Nursing Resource Center. Scholars also practiced surgical techniques at the veterinary college and learned the many roles of a pharmacist, prescription-writing specifics, the science behind drugs and the rigor of being a physician assistant. A smoking car, volunteers coated in fake blood and moaning from injuries, and Gainesville and Alachua County public health and emergency medical services crews all combined one muggy day in June for perhaps the most riveting training exercise for the SHPEP scholars. As smoke from the mock car bomb wafted across the field, the SHPEP scholars ran to help the sprawled victims. Guided by UF and local public safety agencies, the scholars learned how to triage, treat and transport dozens of patients. “This scenario was chosen after a team of medical providers came together to create an innovative way to expose the students to a mass casualty disaster relevant to today’s times,” said Takeshia Pierre, M.P.H., UF SHPEP program coordinator. “This experience provided real-world, immediate skills that the participants could take back to their communities and, in the event of an emergency, they can make a difference for their family, friends and community,” added Probert. UF is the first SHPEP program to incorporate a mass casualty exercise into the curriculum. The drill emphasized objectives including pressure on wounds, tourniquets and immobilization, all of which are related to the U.S. Department of Homeland Security’s Stop the Bleed campaign. Launched in October 2015, Stop the Bleed is a national awareness campaign intended to encourage bystanders to become trained, equipped and empowered to help in a bleeding emergency before professional help arrives. 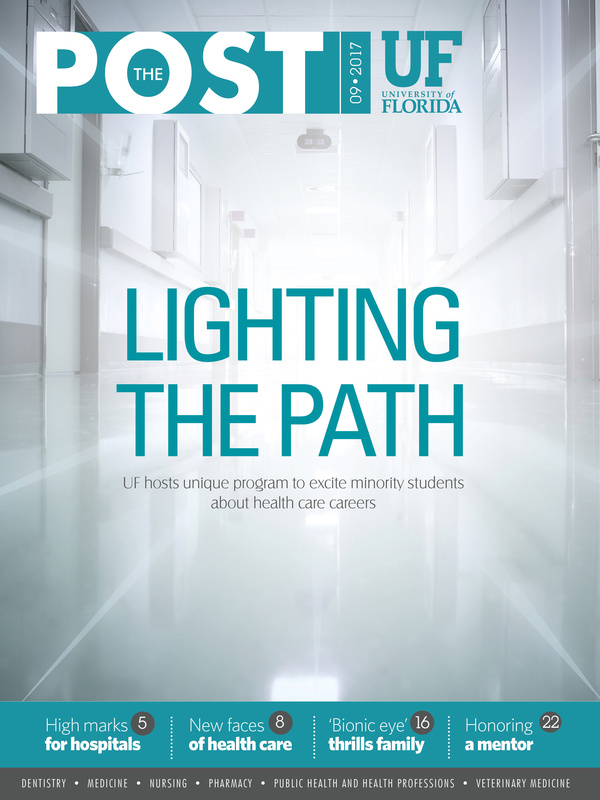 Access to UF faculty and staff was one of the many benefits of SHPEP, but the program went a step further: It gave scholars a chance to spend time with minority UF students with similar backgrounds, who were exploring a health profession they aspire to join. The scholars were not alone in recognizing the value of the mentoring. Now in her third year of veterinary school, Nelson relished the opportunity to spend a summer Sunday morning working with the next generation of health care professionals during the SHPEP veterinary medicine future surgeon experience. Linda Lavadia, a second-year UF dental student, knows first-hand the value of programs like SHPEP. As a biomedical sciences major at the University of Central Florida, she attended the Summer Medical and Dental Education Program in Ohio, which solidified her passion for dentistry. Lavadia’s experience came full circle when she got the opportunity to serve as a mentor. At the program’s end, SHPEP left some scholars toggling between aspirations of being a veterinarian or a physician assistant, changed some minds from pharmacy to nursing, and opened other eyes to health care professions they never knew existed. Most importantly, the program provided all of the students a voice for themselves and the confidence to advocate for their needs, and a multitude of tools and resources for successful application to and matriculation into health professions education. Professional, intrigued and engaged — all words used to describe UF’s first SHPEP cohort. Six weeks set up the potential for a lifetime of success. Now, the cycle recommences. Probert and the faculty and staff committee will set their sights on applying for the grant for summer 2018.